The Yankees are in the middle of their best stretch of the young season. 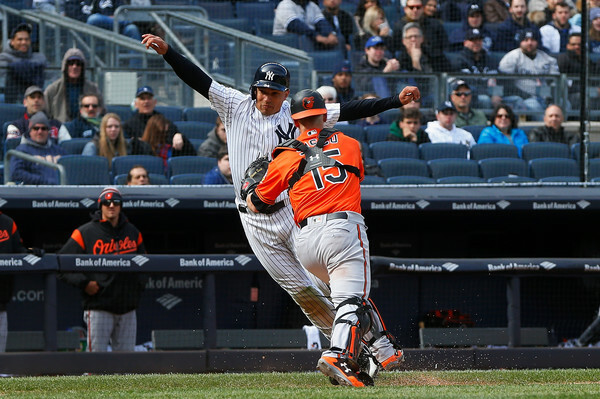 They’ve won their last three games — the Yankees have held their opponents to one run in all three games — and seven of their last ten games overall. Thanks to this stretch, the Yankees now lead baseball in runs per game (6.05) and are merely 19th in runs allowed per game (4.81). That’s a heck of a lot better than where they were a week ago at this time. Cloudy, cool, and windy in New York this evening, and there is some rain in the forecast later tonight. The internet tells me the heaviest stuff isn’t due to arrive until after midnight, so things should be fine for the game. First pitch is scheduled for 6:35pm ET and you can watch on YES locally and MLB Network out of market. Enjoy the game. Injury Updates: Greg Bird (ankle) is heading to Tampa on Friday to continue his rehab work. He’s making good progress so far … Brandon Drury (migraines) will play seven innings at third base with Triple-A Scranton tomorrow, rest Thursday, then play a full nine innings Friday. It’s possible he could rejoin the Yankees after that, if all goes well … Tommy Kahnle (shoulder, biceps) is still doing rehab work. He’s yet to resume throwing. Kahnle was placed on the disabled list April 17th and the Yankees said he would be shut down ten days, so nothing’s changed, really. Roster Move: So long, Jace Peterson. 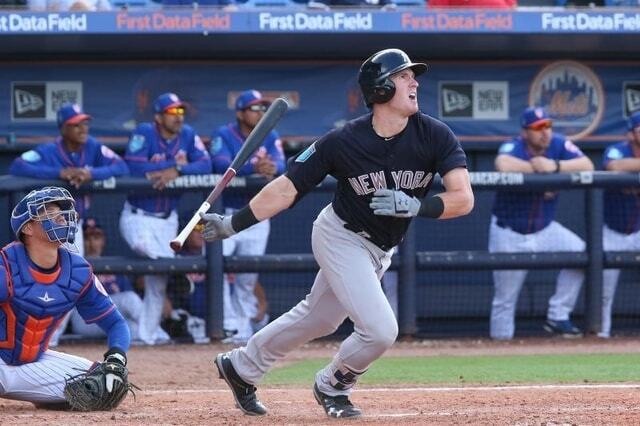 He was claimed off waivers by the Orioles earlier today, the Yankees announced. Peterson went 3-for-10 with a walk in pinstripes. Could’ve been worse. Less than two years ago the Yankees plotted a course that changed the direction of the franchise. They decided to sell at the 2016 trade deadline, not buy, and as good as the Yankees were last year and as talented as the roster is this year, we’ve yet to see the impact of those 2016 deadline trades. Adam Warren is still around and Clint Frazier was up for a few minutes last season, but that’s about it so far. Today, the prized 2016 trade deadline pickup arrives in the big leagues. As expected, the Yankees have called up Gleyber Torres, and he is in this afternoon’s starting lineup at second base. Aaron Boone made it clear this morning that the plan does not call for Torres to be a short-term addition to the lineup. He’s here for the long haul. 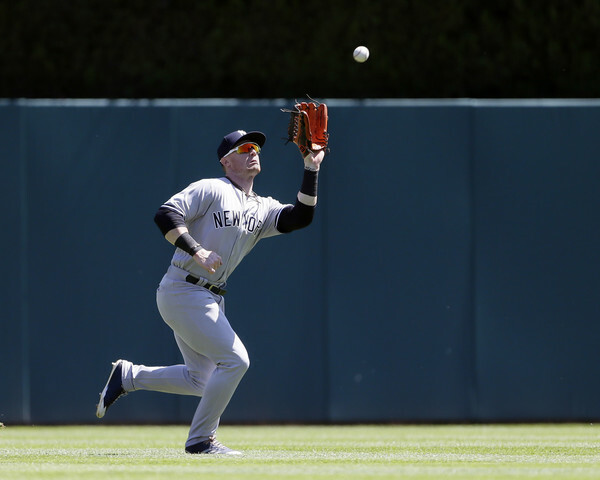 The plan is primarily second base, but Gleyber may see some shortstop and third base as well, depending on the team’s needs. Torres hit .370/.393/.510 (154 wRC+) with one homer in 13 Triple-A games and, interestingly enough, Boone seemed to indicate Gleyber would’ve been called up sooner had he not missed time with back stiffness last week. 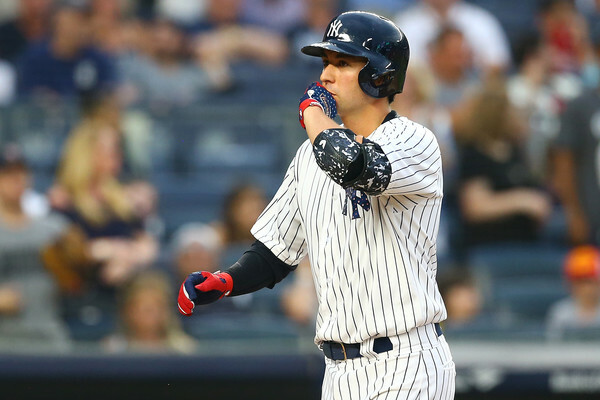 The Yankees wanted to make sure he’s right physically — both the back and after last year’s elbow surgery — and is back up to speed at the plate before calling him up. 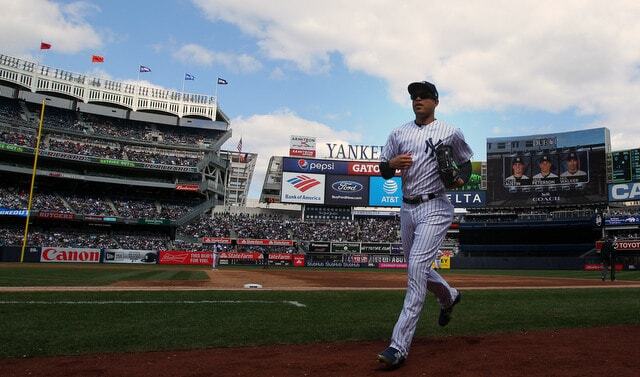 They feel he is, and now here he is, starting at second base in the Bronx. 9. SS Lourdes Gurriel Jr. It is a wonderful day for baseball in the Bronx. Nice and sunny with a slight breeze. A little chilly, but that’s better than freezing cold. This afternoon’s game will begin at 1:05pm ET, and you can watch on YES locally and MLB Network out of market. Happy Gleyber Day, everyone. Enjoy the game. Roster Moves: As expected, Tyler Wade was optioned to Triple-A Scranton to clear a spot for Gleyber. Wade will play everyday for the RailRiders (duh). Torres was already on the 40-man roster, so no other move was required … Also, the Yankees have called up righty David Hale to serve as a long man. He’d been starting in Triple-A and is stretched out to 90-ish pitches, so he’s available for super long relief, which I hope is not needed. Jace Peterson was designated for assignment to clear 25-man and 40-man roster space for Hale. 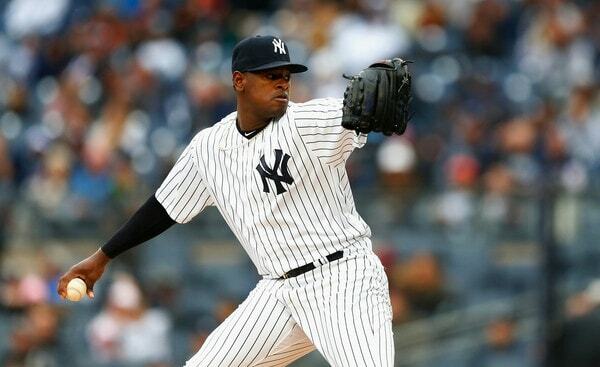 The Yankees are now carrying eight relievers and three bench players. 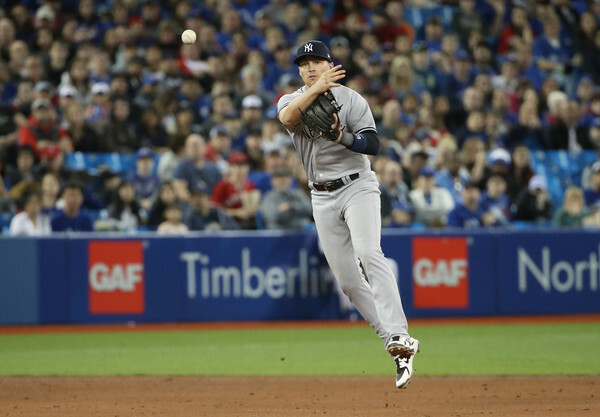 Injury Updates: Brandon Drury (migraines) has been diagnosed with irritation in a tendon running up his neck and into his head, which is causing his headaches and blurred vision. Doctors have developed a treatment plan. Drury is taking batting practice and fielding grounders and all that in the meantime, though his return is not imminent. 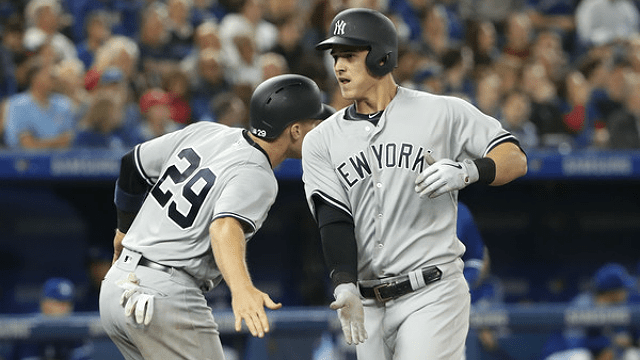 He’ll need a minor league rehab assignment first … Greg Bird (ankle) feels good and is expected to increase his hitting and running workloads this week. He’s still looking at a return at some point in mid-to-late May. After back-to-back rainouts in Detroit, and despite heavy rain in New York this morning, the Yankees are finally back in action tonight. It’s still chilly and very windy in New York, but the rain has stopped, and that’s the most important thing. The Yankees haven’t played since Friday and they’ll be back at it tonight, thankfully. The rain has cleared out but, like I said, it’s still cold and windy in the Bronx. Not a great night to sit in the ballpark, really. Tonight’s game will begin at 6:35pm ET — the Yankees are testing out some early start times this month — and you can watch on YES. Enjoy the game. Roster Move: Welcome back, Jace Peterson. 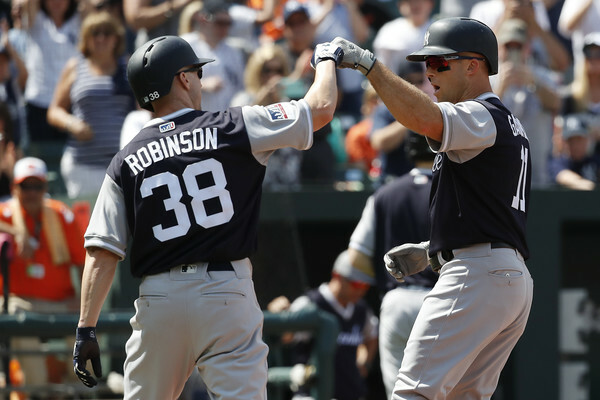 Sunday he cleared waivers and elected free agency rather than accept his outright assignment to Triple-A Scranton, then this afternoon the Yankees re-signed him to a new contract, the team announced. Peterson is on the MLB roster. He replaces Luis Cessa, who was sent down yesterday. 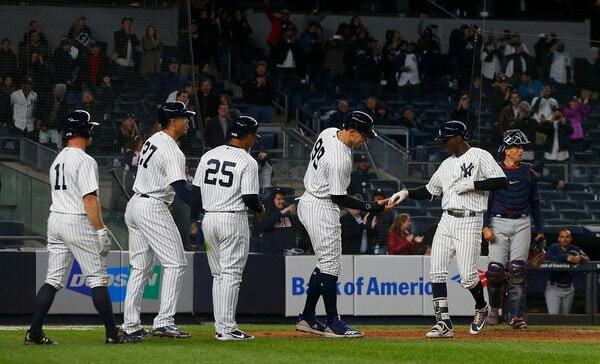 The Yankees have a four-man bench for the first time this season. Injury Updates: Brandon Drury (migraines) still has headaches and blurred vision, and it gets worse during physical activity. He did take batting practice today though. Drury has been prescribed medication by a specialist, and has more tests pending. When asked whether he’s ever gone up to the plate with blurred vision, Drury said “all the time.” Okie dokie … Jacoby Ellsbury (oblique, hip) also has plantar fasciitis now. He hurt his foot while rehabbing his hip, which he hurt while rehabbing his oblique … Greg Bird (ankle) played catch and took ground balls today. He had his stitches removed last week and this is the first time we’ve heard about him doing any sort of baseball work. Aaron Boone said the Yankees are optimistic Bird will return “on the shorter side” of his 6-8 week timetable. Suspension Update: Tyler Austin is expected to have his appeal heard later this week, likely Thursday. He received a five-game suspension for last week’s brawl with the Red Sox. It might get knocked down a game or two, but the suspension won’t be wiped away. Austin did charge the mound, after all. The Yankees will have to play with a 24-man roster during the suspension. Site News: More information is coming, but we’re having an RAB Day at Yankee Stadium next month (May 12th vs. Athletics). Here are some of the details. We’ll post more info in a day or two. I just wanted to get that on everyone’s radar. Placed CC Sabathia on the 10-day DL with a right hip strain. Placed Brandon Drury on the 10-day DL with severe migraines. Optioned Jonathan Holder to Triple-A Scranton. 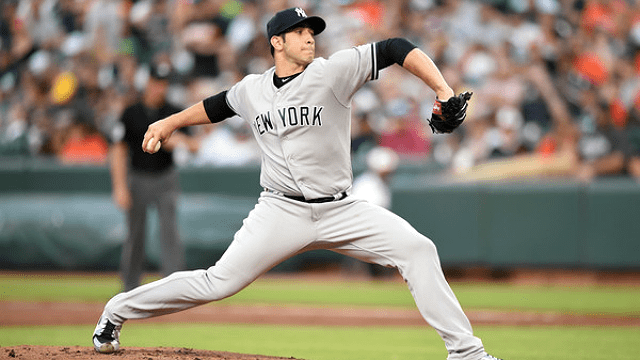 Called up Luis Cessa and Domingo German from Triple-A. Added Jace Peterson to the 40-man roster and called him up from Triple-A. The Yankees had an open 40-man roster spot after losing Trayce Thompson on waivers a few days ago, so no 40-man move was necessary to accommodate Peterson. Three removed from the 25-man roster and three added to the 25-man roster. Straight swaps. 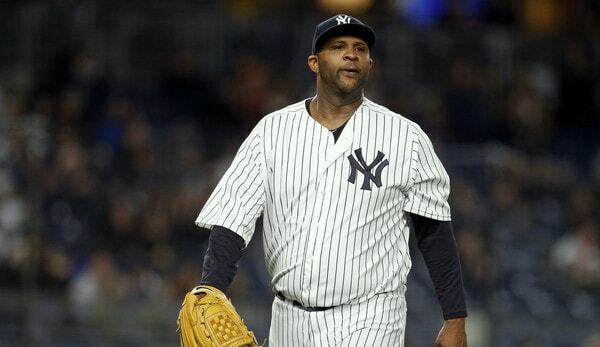 Sabathia left last night’s start with right hip soreness and an MRI came back clean. He said he didn’t believe he’d have to miss a start, and even if true, the Yankees are going to play it safe early in the season. Monday’s off-day means Sabathia will only miss one start if he misses the minimum ten days. Drury left last night’s start with a migraine and blurred vision. Assuming Peterson takes on a bench role, Miguel Andujar could get an opportunity to play third base on an everyday basis for at least the next ten days. That’d be cool. Something tells me Ronald Torreyes will see some action there as well. The Holder, Cessa, and German moves are all about adding fresh arms following last night’s 14-inning game. Holder has not been good this year (seven runs in 2.2 innings) and is the only optionable reliever in the bullpen, so down he went. Cessa was scheduled to start today for the RailRiders and German was due to start Monday. Presumably either Cessa or German will step into Sabathia’s rotation spot for the time being, and it might come down to who is available. Monday’s off-day means Aaron Boone can use both in relief this weekend and still have them make Sabathia’s next start, which could be pushed back to next Saturday, on normal rest. The Yankees now have eight (!) players on the MLB disabled list: Sabathia, Drury, Greg Bird (ankle), Jacoby Ellsbury (oblique, hip), Clint Frazier (concussion), Ben Heller (elbow), Aaron Hicks (intercostal), and Billy McKinney (shoulder). Hicks is expected back as soon as Tuesday. The other guys are all a little further out. Also, Tyler Wade left last night’s game with an illness, so he’s not 100% either.